Steps in Time is a poetry app that guides you on a poem-walk across Newcastle-upon-Tyne. Discover, through poetry, the secret histories of lesser-known places like Dog Leap Stairs and High Friar Lane, and celebrate iconic buildings such as the Civic Centre and Grainger Market. Sixteen regionally-based poets offer up their responses to sixteen unique locations to tell new stories and shine new light on the cultural and social history of Newcastle. 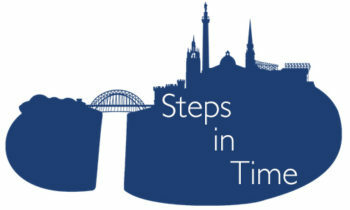 Steps in Time was developed as part of the 2017 Newcastle Poetry Festival, which ran from 9th – 13th May. The locations chosen for the app form a loose path between Northern Stage and Sage Gateshead, the two venues for the festival. Developed by Newcastle Centre for the Literary Arts in association with Cuckoo Young Writers, GemArts, The Writing Squad, and The Sixth Floor Ageing Creatively Group.